hands-on approach not only conveys important topics, but also helps readers possess the skills they need to be successful in management. The Fourteenth Edition contains updated information and new case studies and examples to reflect the most recent research and developments in the management world. 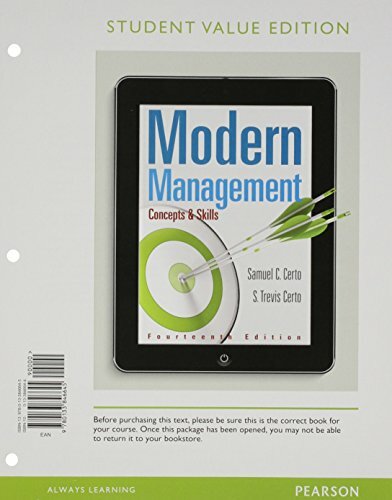 Illustrated with beautiful photography, the text remains engaging and concise while communicating the most important concepts in management." "Also available with MyManagementLab(R)MyManagementLab is an online homework, tutorial, and assessment program designed to work with this text to engage students and improve results. Within its structured environment, students practice what they learn, test their understanding, and pursue a personalized study plan that helps them better absorb course material and understand difficult concepts.